To present the Republic of Gamers sub-brand, as well as produced underneath the motherboard, laptops, monitors and the video card, there is no need. But smartphone, smartphone! Now there he is – and goes to market he is not alone, but with a whole set of accessories: more than appropriate controller and hubs that can operate it with external monitor to completely original things like external cooler (supplied) and set-top boxes that adds to the smartphone’s second screen. Approach ASUS for gaming smartphone features not only the creation of an entire ecosystem, but also atypical set of characteristics of the device. Just a more aggressive design, improved cooling system and extended RAM ROG was not confined to Phone – in with AMOLED-display with a refresh rate of 90 Hz (here Razer Phone 2 can compete), stereo speakers, derived in the frontal plane (in the style of Sony Xperia XZ3), additional sensors AirTriggers, enhance operation, the second port of the USB Type-C (the side face), specially developed software and a number of smaller changes. ASUS ROG Phone was presented at the June Computex 2018, but gets to the market just now. 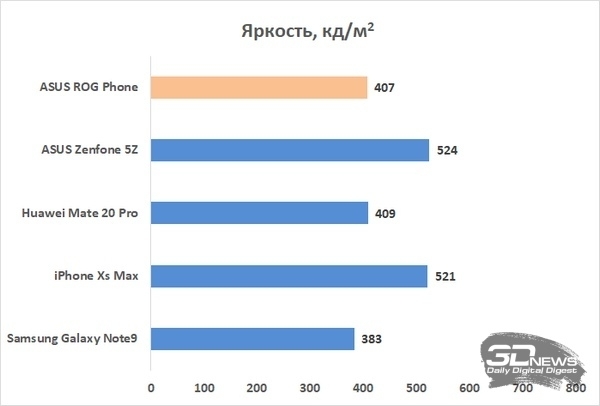 The stated price is a younger version of the (128 GB main memory) is 69 990 rubles, but just to talk about the competition with the flagships of Apple, Samsung, Huawei or Sony is wrong, despite the mandatory comparative table of characteristics and performance. Of course, ROG Phone – a detached instance with your audience and their competitors Xiaomi and Razer Black Shark 2 Phone, and to estimate his worth in this section. 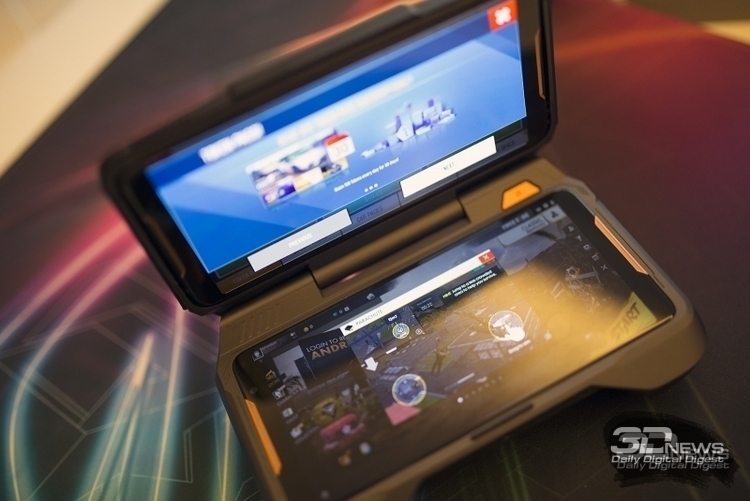 To test the ASUS ROG Phone came fully prepared with all the possible accessories, and the signature suitcase. Unfortunately, complete in suitcase gadget is not sold in Russia (in this form it is only found in Taiwan), but very impressive, of course. 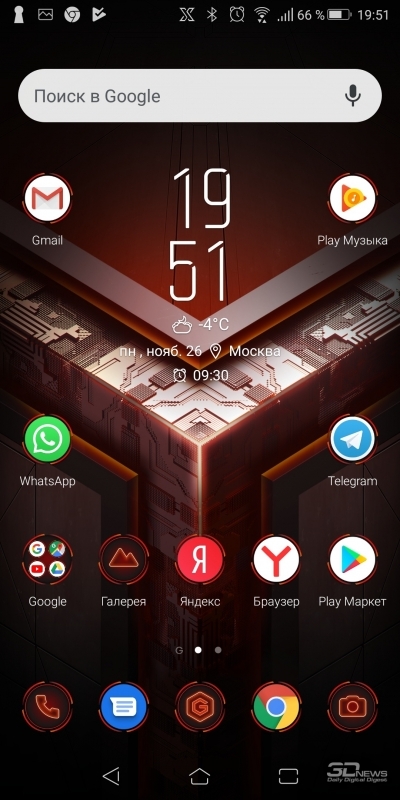 How to look like a gaming smartphone? This question designers especially ROG Phone is not even asked: it is obvious, as well as all other gaming devices, whatever they were – peripherals for PCs or for those PCs. More broken lines, bright color accents on the General dark background (surprisingly, not red, and copper), as well as the grille, hinting at what’s inside the muscles, which require active cooling. ASUS ROG Phone looks basically the same as other devices produced under the brand Republic of Gamers. And it is rather good – in terms of identity. In terms of pure aesthetics and competition from an equally intricate Xiaomi Black Shark and Razer Phone 2 – to tell difficult. 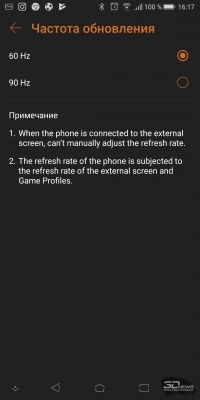 But at least ASUS ROG Phone easy to distinguish from any mainstring smartphone. 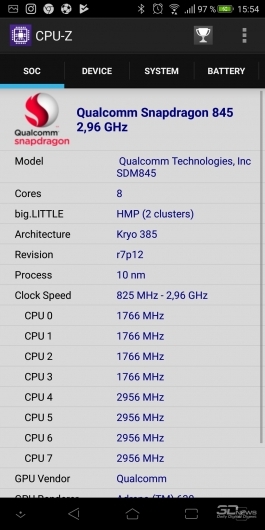 However, he has several typical smartphone 2018 release hell. Yes, he has missed cut the top face – nothing should distract the user ROG Phone from the picture on the screen – but in place of the glass panel on the front and on the back have not gone away and the metal faces, an elongated display format 18:9 and dual camera. However, who am I kidding – still to give this thing something typical not come. Color scheme – the one and only, ROG Phone can only be black. 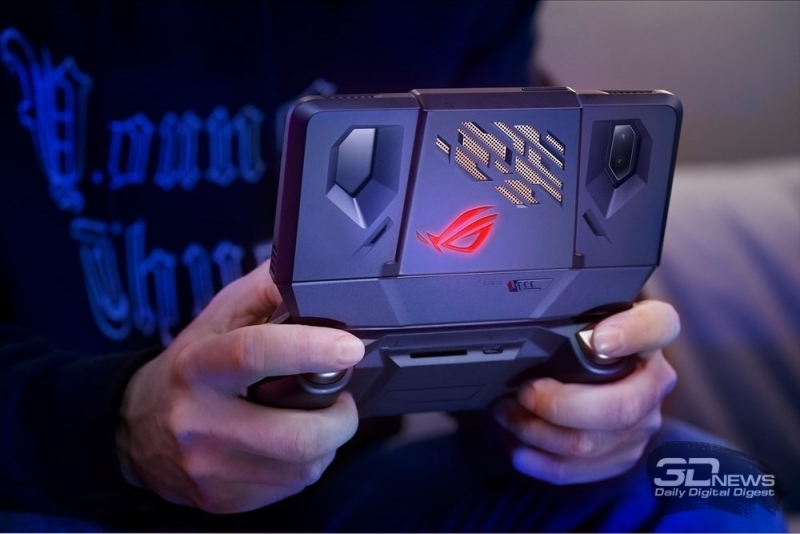 Like most other devices Republic of Gamers, no indications belonging to the ASUS brand the case there is only a logo of ROG with supporting information with a signature. And Yes, the logo lights up when you activate game mode in the manner of illumination of any gaming laptop. The color can be set, as well as the surge, including syncing with other ROG Phone that are in the same Wi-Fi network — now all the manufacturers of gaming devices are confident that any gamer excited for these games. ASUS ROG Phone for a smartphone with only a six-inch display (2018, what are you doing, stop it) has impressive dimensions – by 158.8 × 76,2 × 8.3 mm. It is even more disproportionate than healthy iPhone Xs Max. The corresponding weight – 200 grams. Yes, this is a very big gadget. And if for all smart phones with a glass back, I usually recommend to use a case, in this case it will turn ROG Phone into a monster. By the way, about the cover – it is not included with the smartphone, sold separately: this trehlistna design of plastic, which is partially mounted on the housing ROG Phone with stickies and, frankly, feels like a foreign element. Want to immediately unstick it and remove back into the box – which I did after five minutes of using Shrouding gadget. The more that the oleophobic coating on both the display and on the back allows you to make such a decision without major consequences for the appearance of the device — if it is, of course, not to drop. Despite its visual originality, ASUS ROG Phone has a pretty standard layout: the hardware the power key and volume controls on their standard places (the right side), USB Type-C and mini-Jack on the bottom edge, and a fingerprint scanner let and unusual shape (it is rectangular), but is located on your backseat, not far from similar to it in appearance of unit dual camera. Of unusual solutions note again the two front-facing speakers and a port for an external cooler that can be used as an alternative connector USB Type-C. Grille on the back panel, which can be taken for duct internal active cooling system, carries only a decorative value – no fans inside the ROG Phone, of course not. ASUS ROG Phone can be unlock using fingerprint scanner and recognition system, face. But a 3D scanner as in iPhone X/Xs or Huawei Mate 20 Pro, or at least IR in the manner of Xiaomi Mi 8/Mi MIX 3 is not here — only the front camera. The reliability is low, in-the-dark smartphone you will not see. But the day unlocking this method works very fast, no complaints. 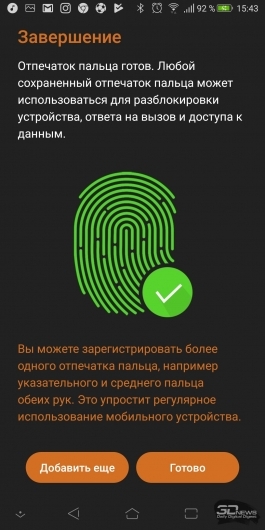 Fingerprint classical, capacitive works very fast. But he lacks a bit square, so the defect rate is slightly higher than that of a conventional, round scanners that your finger is placed entirely. Your smartphone ASUS has set a specific shell ROG UI on top of Android 8.1 Oreo (eventually will upgrade to 9.0 Pie). Despite the different name, anyone who ever used the smartphones of the Taiwanese company, it will seem familiar – unlike the Zen UI not so much. 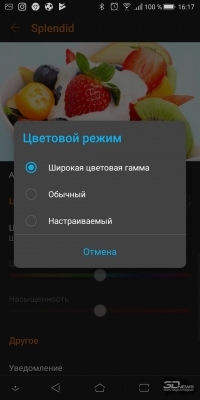 The same fonts, the same notification bar and settings are very close to the pre-installed SOFTWARE, navigation panel, that can be removed from the screen (but not to gestures but to move your finger down to get back in time). The difference is striking, of course, the characteristic theme with special icons for all corporate applications. Special attention should be paid to background for your desktop in the form of such high-tech cube – when activating the “boost” he opens up and begins to glow demonically red. 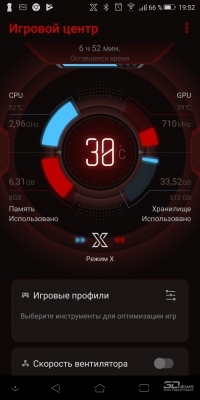 From unique to ROG Phone moments, in addition to the original design of the interface, note the game center, where you can monitor various parameters of the hardware until its temperature, and to control external lighting, external fan and game profiles that can be assigned for each of the installed games. Also the firmware is, of course, knows how to make friends with many accessories – for the sake of this whole rigmarole with a new shell, in principle, was conceived. Otherwise it is quite normal for ASUS – functional, fast and seeming a little overwhelmed by the options. All is good, but I had a lot of claims to the stability of the new firmware. For example, there are problems with recognition of the charger – if you charge a smartphone using the original adapter ROG Phone not until the end, he believes that it is still charging even when disconnected from cable. Only a reboot helps. Excessive heating is observed in the performance of basic features (like video playback) – a clear problem in the redistribution of loads. Throw in a very active drain on the battery even in standby mode. Finally, we mention a number of small moments like falling off without explanation applications. I hope all this will be fixed in the final firmware. Many companies trying to experiment in smartphone control: someone raises proven techniques from the past (Samsung Galaxy Note and stylus), one uses the curved edge of the screen (same as Samsung or Sony in the Xperia XZ3), someone offers to compress the smartphone (HTC). But the most interesting way in his meticulous approach to creating game smart phone found it ASUS. 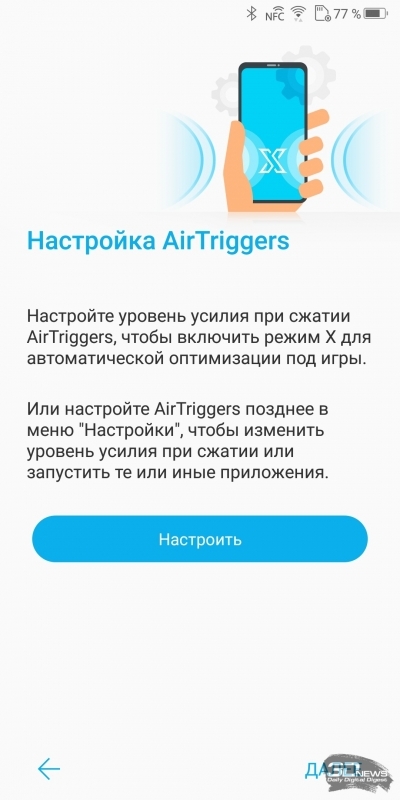 The smartphone under the “virtual” keys AirTriggers allotted two zones on the right side (which becomes the top when landscape grip – necessary for a comfortable game in most applications) and one on the left side. This ultrasonic sensors that can be independently assigned to different teams to taste. They are convenient to use, when you touch these areas vibrate, giving an adequate response. And the user gets the most important thing that is required from a gaming gadget – a small advantage in the game due to easy management. 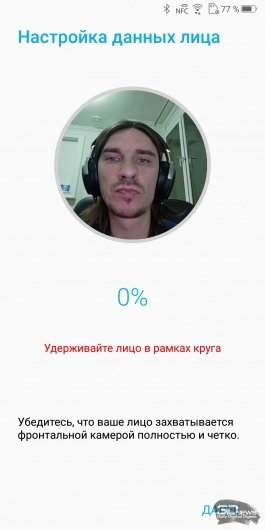 The option “compression” in the manner of HTC U-series here too – outside game mode on you can hang different functions. By default, it activates the “boost” ROG X. If AirTriggers not enough, the aid comes already full gamepad ASUS GameVice price of 5 990 rubles. It mounted with USB Type-C does not require a separate charging and has a magnetic bridge that allows you to carry it in the folded state with you everywhere – without fear that he will be unwound and will hang in a backpack anyhow. The set of controls is typical for a controller: two analog stick, d-pad, four “pedals”, four buttons and three extra buttons. All this machinery can be set in the Game Genie (it runs simultaneously with the game), and separately binding the UI elements to the controls for each game. Unfortunately, there are difficulties with that – if some games keys and analog sticks attached without any problems (as, for example, in Asphalt 9), others (for example, Shadowgun: Legends) is somewhat sloppy. Dock TwinView price of 19 990 rubles ROG turns Phone into a dual-screen gadget in the manner of a Nintendo DS, only without the controller connected, of course – it has nowhere to connect. The smartphone in this case is removed in the case with an additional screen and set there tight, without the possibility to use additional accessories. 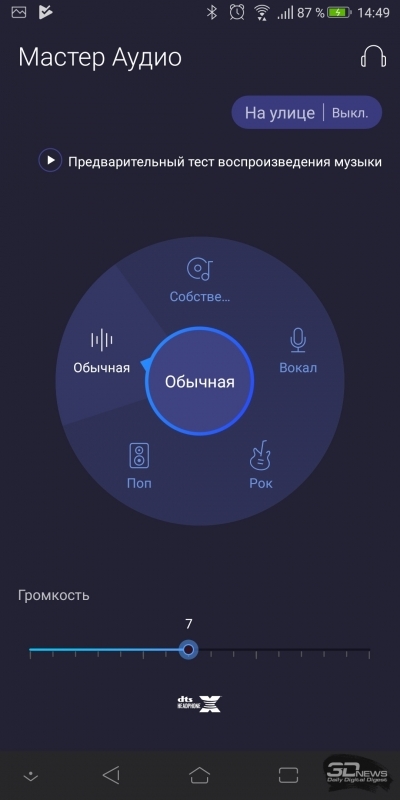 The station has its own battery capacity of 6000 mA·h Thing peculiar, but useful to those who are accustomed to doing several things at once – play the game, for example, while watching (listening to) the stream on Twitch or Youtube. Well, or to play the game and chat – why not? Docking station ASUS Mobile Desktop price of 12 990 rubles, and ASUS Professional Dock price 5 990 rubles ROG allows you to connect the Phone to the monitor and peripherals to create almost full-fledged gaming or work desktop-based smartphone. Their difference in size and functionality. 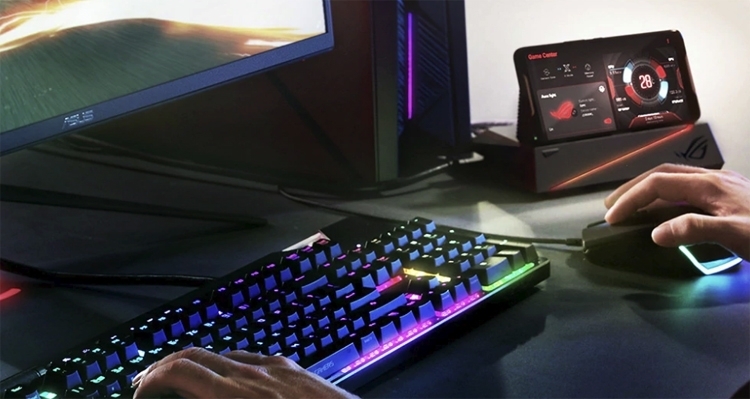 If Professional Dock must be connected to the ROG Phone using the cable, and at the station there are only two USB Type-A (primarily mouse and keyboard) and one HDMI and Ethernet, Mobile Desktop has as many as four USB Type-A, two mini-jacks, HDMI, two DisplayPort, an Ethernet connector, a USB Type-C USB Micro B 3.0 and card reader for SD, and installed smartphone directly into the docking station with the side port. Docking station WiGig price of 17 990 rubles allows you to connect your smartphone to the monitor without wires (smartphone, of course, while the station with the monitor still have to be linked via cable). Despite the formal “death” of the format, 60-GHz 802.11 ad continues to be used – to ROG Phone connected to the docking station, you must activate the corresponding icon on the notification bar. Compare with Miracast WiGig (with the help of this system can be connected to a monitor or TV almost any smartphone) is meaningless – WiGig delay is 20 MS, and Miracast – 500 MS. To watch movies Miracast place to play games – no. 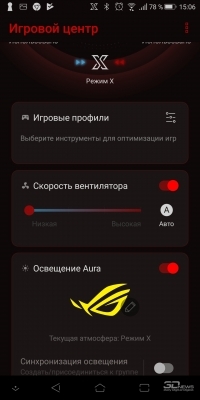 On the design and management of ASUS stopped awarding ASUS ROG Phone very interesting display. This six-inch AMOLED with a resolution of 2160 × 1080 pixels that provides a pixel density of 402 ppi. Not much for the flagship – pixelation of fonts you will not notice, but in games and 4K video some lack of detail to see with a strong desire. 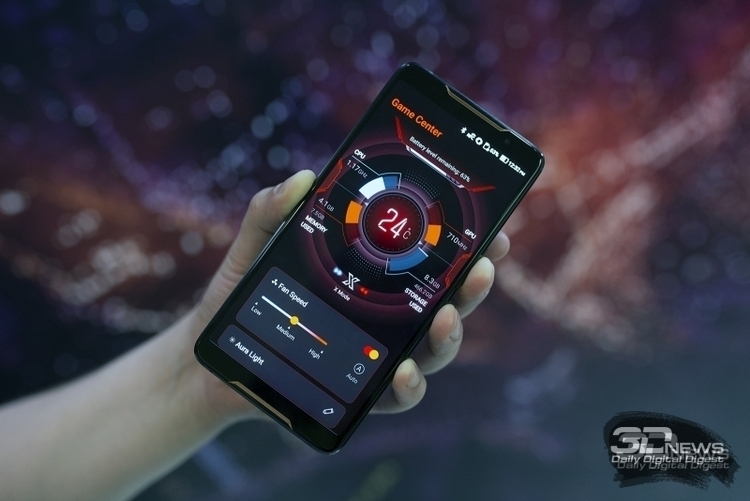 But the point of the ROG display Phone, and the ability to turn the refresh rate to 90 Hz. Response time is stated as 1 MS. Yeah, ROG Phone will give let small, but the advantage in multiplayer games – ensuring the normal ping you’ll notice taking place in the same PUBG Mobile before your opponents. The only thing your competitors are users of Razer Phone 2, display (LCD display, please note!) which refresh rate is 120 Hz. Otherwise AMOLED-matrix, which is used in the ROG Phone is quite good, but not outstanding. The measured maximum brightness of 407 CD/m2. A few not quite live up to the stated maximum of 550 CD/m2 – however, there are likely impact would be to end the adjustment display under external light (the measurements we are doing in the dark in order to avoid external light exposure). 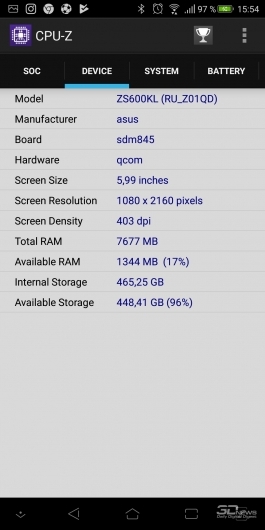 However, the figures are close to those required for compliance Gaming Mobile HDR and HDR disable HDR to get a less dark picture (recommended for smartphones, the display does not meet the standard until the end), is not necessary. The angles free, with a strong deviation of gaze from the perpendicular and the colors do not change, and the contrast almost falls. There is a polarizing layer, on a Sunny day to use the phone without any problems. 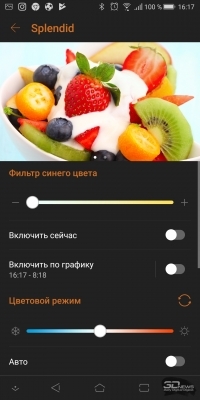 In the settings you can not only traditionally set the filter of the blue color to reduce eye fatigue at bedtime, or to customize the display of information on the smartphone with a locked screen (Always-On Display, almost mandatory feature for the device with an OLED display), but also to adjust color, and how to use the presets or manually. I measured the color reproduction of the display ASUS ROG Phone with two presets – “wide” color gamut, involving the coverage of DCI-P3, and “normal” that is configured for compliance with the standard sRGB. 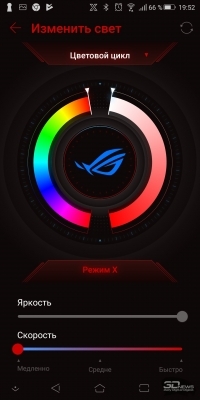 Default ASUS ROG Phone is “wide color gamut”. The average range in this mode of 2.09 is at a relatively normal curve, with a median color temperature is around 8 To 250, which is considerably above normal (6 To 500). The average deviation of DeltaE scale Color Checker including a wide range of colors and shades of gray, made up 7.42 – alas, talk about any kind of color accuracy in this mode is impossible. Picture, vivid, cool and markedly different from the, so to speak, the author. When switching color in the normal color mode color gamut is narrowed, to talk about the standards HDR is no longer necessary. However, sRGB is also not yet it seems. However, increased accuracy. Average gamma is 2.10, the color temperature still rises a little (about 8 500 K on average), but the deviation DeltaE scale Color Checker is of 5.05 – already better than the extended format. The problem here is in the offset range of colours and cold colours. In General, the display is set to medium, but greater precision is possible by adjusting the color manually, the benefit of such an opportunity. ASUS ROG Phone is not deprived mini-Jack, this connector is duplicated on all the accessories and docking stations, blocking access to it. In General, ASUS is not trying to forcibly force you to use wireless headphones, Bluetooth although there is the standard it supports aptX. This smartphone does not provide any special sound quality – it’s the same, good enough, the level of the ASUS Zenfone 5 or Zenfone 5Z. Lacks a bit of headroom in transport have to drag the volume slider to maximum. But to built-in speakers not reproach – and then with the volume full order, and the quality of sound for tiny speakers is impressive, and the stereo effect is available. Perhaps the ASUS ROG Phone for this option is the top spot along with the Sony Xperia XZ3. As for the microphones and speaker – then to ROG Phone no claims to talk with it comfortable.